"The Ultimate Showdown". Infernal Affairs III is a 2003 Hong Kong crime thriller film directed by Andrew Lau and Alan Mak. 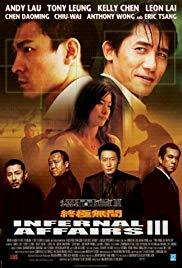 It is the third installment in the Infernal Affairs film series, and is both a sequel and a semi-prequel to the original film, as it intercuts events before and after the events in the original.